At IdealShape, we know that small changes can equal big results. That’s why we created the 30-Day Weight Loss Bundle! If you’re able to effectively combat hunger while controlling calories, you will find success on your weight loss journey! 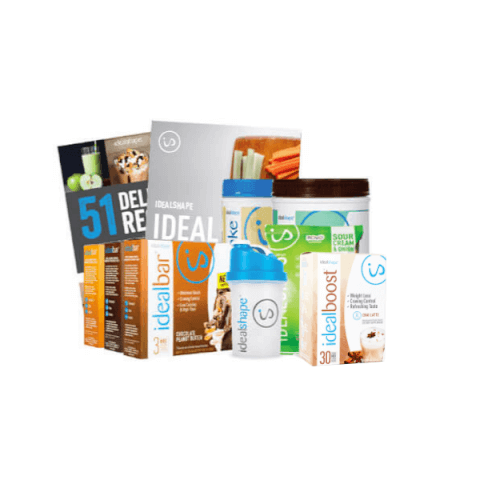 With this complete weight loss bundle, you get delicious, convenient shakes and snacks, access to the IdealPlan, high-value eBooks, expert advice, and more. With IdealShape, losing weight has never been easier! I absolutely love the product over all! The Strawberry shake is my favorite. The vanilla is good and the chocolate taste like pudding. The ideal bars are hit and miss. I like the chocolate bar, the strawberry yogurt bar is nasty (horrible gritty taste), the caramel cinnamon crunch is ok (the cinnamon is a bit over powering) and they all have an underline gritty aftertaste. The chips took some getting used to but now I love them! The BBQ and Sour cream and onion are my favorite! The idealboost drink mix are outstanding. They all taste great, gives me lots of energy and curves hunger for up to 3 hours! I've been incorporating the product into the 5;2 diet and I've had wonderful results! 1 month using it and now I'm 11 lbs down I plan to continue using this product and restocking monthly. I wouldn't suggest grambling with the different flavor shakes (the reviews weren't great for them), I would just stick with the basic (chocolate, strawberry and vanilla). This package helped me get into replacing breakfast! Then I started going to the gym. Mocha and chocolate taste awesome. This brand is the best for me. No chalky taste. I actually want it every morning. Thank you!! Excited to start, looks yummy! After some consideration (shakes and the flavor usually scare me away)..I saved my money and bought the 2 tub deal in Salted Carmel and Mocha. I FELL IN LOVE! I mix the SC with unsweetened almond milk..1/2 banana and a cup or so of ice and blend. Fills my bottle to the top and I drink it all the way to work. Its delicious..satisfying! And...best part? It controls my hunger!!! At lunch I mix the Mocha with raspberries..good Lord.....AMAZING! Between my shakes...I follow your plan. I have done this consistenly for 7 days with a cheat meal yesterday afternoon and this morning? 6 pounds lost!!!! I love the ease..I love how you took all work out for me except grocery shopping (ugh) but I will manage. I have great expectations and somewhere deep in my mind...I secrettly want that cruise. My husband and I have not been anywhere since 1990. If this is how I can achieve that. ..then I will try my hardest. Thank you for a product that just may work for me. I found your reviews on shipping a little scary but Ive decided to overlook that since my order arrived fully in tack. No delays..so I will continue based on my own experience!!!! I have recently purchased this pack and have been amazed by how great all the products taste. I chose to go with Chocolate and Salted Caramel flavors and both of them taste amazing, perfect for anyone with a sweet tooth. I have only just started my new diet but I already feel so much more energetic and healthier!